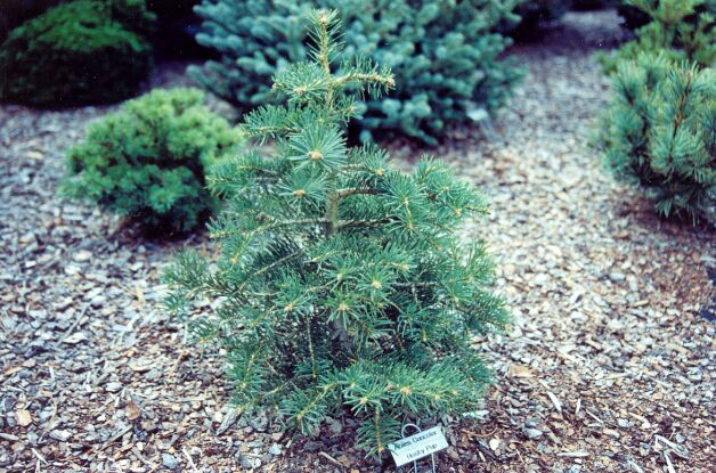 Abies concolor 'Husky Pup' is a dwarf, slow growing, irregular pyramidal form of White fir. Its gray-green needles have two faint Blue gray lines of stomata below and are quite short when compared to the typical species, rarely growing more than 1 inch (2.5 cm) long and 0.08 inch (2 m) broad. The new shoots grow in an irregular pattern unlike most firs, growing 0.8 to 2.5 inches (2 - 6 cm) long, olive-green in color at first, later turning gray-brown on older wood. At 15 years of age, the original plant measured 16 inches (40 cm) tall and nearly as wide at the base. This cultivar originated as a seedling selected by Nickolas Sizoo of Bothell, Washington and later registered and introduced in 1965 by the University of Washington. It should be noted that the Husky is the school mascot at University of Washington. Abies concolor 'Husky Pup' — a young specimen.